you’re going to judge me for what i’m about to say. you think that you won’t but i know you. you’re going to do it. i don’t even blame you for it. i’d probably even judge me too. in today’s world, knowing what we know about what about i’m to tell you, it’s probably not a good thing that what i’m about to say is true. i’m not ashamed of it though. again, i probably should be, but i’m not. you ready to hear it? ok. i’ll spill the beans. now, when i say i like mcdonald’s, i mean that i really do like mcdonald’s. it’s not that i think their coffee is good or i love their wraps. no. i like the burgers that probably aren’t beef. i like the fries that don’t decompose. and i absolutely love the breakfast biscuits. i like me some mcdonald’s. for months i thought about this sign whenever i would pay for my food that was likely killing me. i thought about what it meant. i thought about how most people would flip the order of those words. i thought about why fast should be first, then accurate, then nice. then i thought about how accurate should go first, then fast, then nice. all of the possibilities of the order of those six words bounced around my head at one point or another while waiting for my delicious sausage, egg, and cheese biscuit. 1. be nice. this one’s pretty easy in theory: be nice. being nice is a lot harder to do in practice. being nice means putting our agenda aside. it means smiling when we’re in a horrible mood. it means doing something for someone even though we really don’t want to. we live in a world where being cynical and sarcastic is the norm. imagine how your circle of influence would be different if you made the decision to simply be nice. 2. be fast. all fast means is available. be available for other people. be quick to respond to the text message, the e-mail, the voicemail. whatever it is, be available. being nice is no good to anyone if you aren’t available. 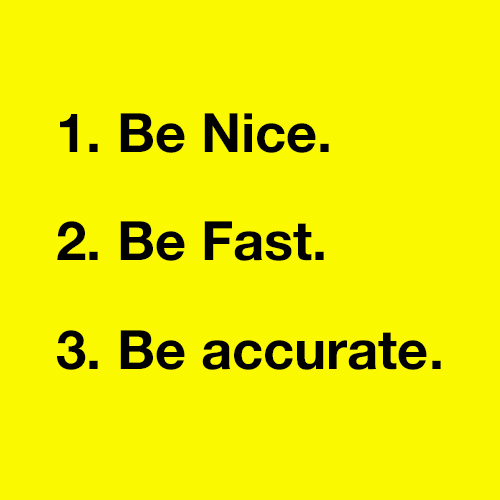 3. be accurate. notice that accurate is last? that means it’s the least important of the three. that sounds counterintuitive, but it’s true. if you can be nice, and if you can be available, being right isn’t nearly as important. don’t get me wrong, if you’re consistently wrong about everything, you begin to lose some credibility, but that doesn’t mean you’re never allowed to be wrong. when you are polite and available, people can be very forgiving when you mess up. would you rather be known as the person who is always there to help and a good friend or would you rather be known as the person who gets it right all of the time? for years i focused so much on getting it right. my design idea was the best idea. my way of doing that one thing was the best way to do that thing. my schedule and my time were of the most importance. want to know where that got me? i was labeled as the guy who put out really good work but could be hard to work with and wasn’t able to be trusted at times. that’s not a fun label. lately i’ve been trying to live by ronald’s trifecta. i try to be as nice as possible. to say i lack tact is to say the sky is blue, the grass is green, and the south is humid in the summer. i know that about myself. because of that, i’ve stopped responding to e-mails a lot of the time and, instead, i will get up and walk to someone in the office to respond in person so they can see my face, hear my voice, and know the tone behind what i’m saying rather than reading what could be a harshly worded e-mail. i’ve also started apologizing a lot. when you go out of your way to be nice, you start to see the places that may not be nice. i try to be as available as possible to people at work while i’m at work. i try to be as available as possible to my wife while i’m at home. i text people when i miss a phone call and know i can’t call them back right away. i let people know i’ve received what they sent me even when i can’t respond fully in the moment. i want people to know they’re important to me and the best way to show that is by being accessible and available. i still get stuff wrong. and i still do things that may not be nice. the difference is people see the effort and will give a pass when we mess up. this isn’t a pass to to not try to get things right. instead, it’s a pass that says i know your heart, i see the effort, and i know this wasn’t on purpose. do you live by ronald’s trifecta? how would your life be different if you did? this week, i challenge you to put it in place. living this way has changed the way i go about my life for the better and i’m sure it would for you as well.